Private Tours of Lake Bracciano, Cerveteri and Anguillara Include: Private transportation, service of driver guide, service of expert guide for Cerveteri, entrance tickets Necropolis in Cerveteri and the Castle in Bracciano, tolls, parking, taxes. Note: Orsini-Odescalchi Castle closed on Mondays. The castle conducts their own tours and so while in the castle, your tour is non-private. Let Well Arranged Travel take you on a private tour of Lake Bracciano’s Orsini – Odeschachi Castle, Anguillara and Cerveteri. In this tour, you will explore castles, tombs and beautiful Lake Bracciano on this private day trip from Rome, also perfect for families travelling with children. It’s an hour’s drive from Rome to reach Cerveteri, an important Etruscan town known for its cemetery. Here you will have a guided tour of the Necropolis, which holds thousands of tombs, some dating back to the 7th century B.C. 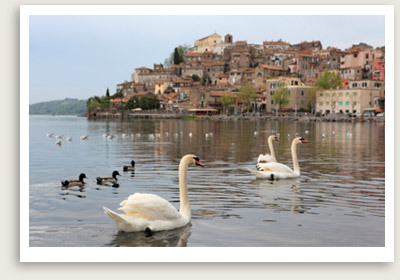 Your driver guide will also take you to Lake Bracciano, from which the ancient Roman town of Anguillara rises. Anguillara was ruled by the Orsini family in medieval times, until the territory was taken over by the Anguillara family in the historic year of 1492. Here you can visit some ancient ruins and medieval palaces. Driving along the lakeside road in Vigna di Valle, you can stop for lunch at La Caletta, one of the best local restaurants. The excellent cuisine here is complemented by the beautiful lakefront views. After lunch the journey continues to Bracciano, where you will visit the Orsini-Odescalchi Castle. The castle was built in the 15th century by the Orsini family, and passed on to the Odescalchis in 1696. The peculiarities of this site included its pentagonal boundary walls, and its manor–house with frescoes by Antoniazzo Romano and other Tuscan and Umbrian artists. The castle has gained modern notoriety as the locale for celebrity weddings like that of Tom Cruise and Katie Holmes. NOTE: The Orsini – Odescalchi castle only allows tours led by their own guide. You may be with other people during the portion of the tour.